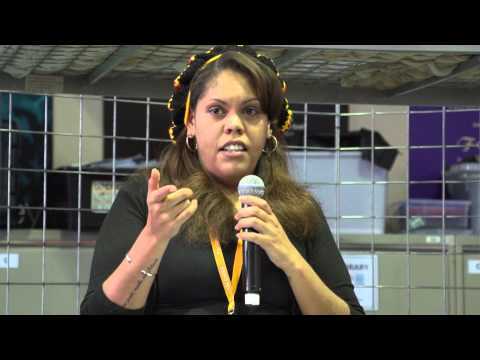 Lorna Munro is a proud, young Wiradjuri/Gamilaroi woman. This dynamic and upcoming writer and poet calls the Redfern/Waterloo area home. She has been strongly influenced and nurtured by her activist parents, and mentored by many other members of the Black Power Movement, who she affectionately refers to as her Aunties and Uncles. She has been an active member of her community since the age of thirteen and has travelled to New Zealand and South America for cultural exchange and youth leadership programs before she was nineteen. Recently she has performed in plays at the Eora College in Redfern, including A Midsummer Night’s Dream and has quickly crossed over to screen featuring in ‘Australia on trial’, a docu-drama for the ABC. Lorna is an emerging artist and has displayed work in Boomali’s 2010 exhibition: “Celebrating 25 years of strength”. She is an experienced tour guide working in the Rocks area over the past two years, and is currently developing programs and tours interpreting the history of her local area. In 2012 Lorna graduated from the University of Technology, Sydney with a Bachelor of Arts in Adult Education and Community Management. In addition to her current work with the Red Room company, Lorna has had work published in the Southerly Literary Journal and is currently writing her own script that is yet entitled.